Old red vintage car italian scene in the historic center of Rome. Italy. Piazza del Popolo in Rome. 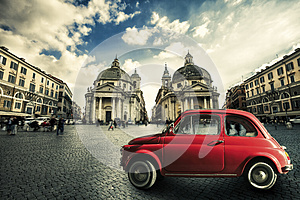 An old small red car is parked in the historic center of the Italian capital. Retro vintage setting. Twin churches in the background.